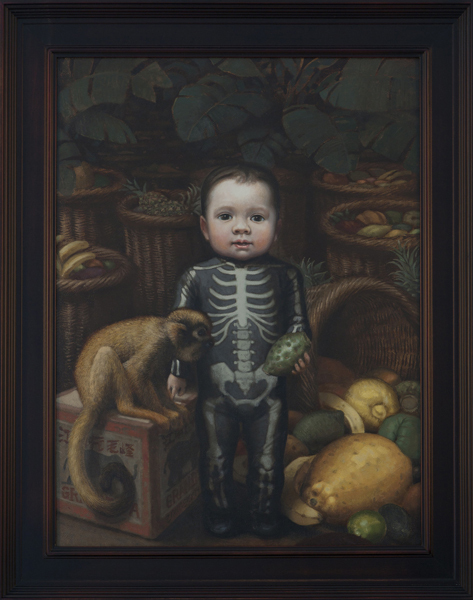 Unsettled: Portraits by Peter Zokosky, which opened last week at Koplin Del Rio Gallery, consists of 19 paintings that feature three distinct groups of subject matter: babies, ventriloquist dummies and stingrays. All of the portraits feel just a little bit "off," which is exactly what Zokosky is aiming for. Come to think of it, was painting rays ever mainstream? Zokosky isn't off-center just in terms of what he chooses to paint, but also in what he manages to make his subjects say. His stingrays -- which were inspired by a trip to the Long Beach aquarium -- are rather friendly. "They seemed to be asking to be painted," is how he explained it to a crowd of well-wishers during the opening. 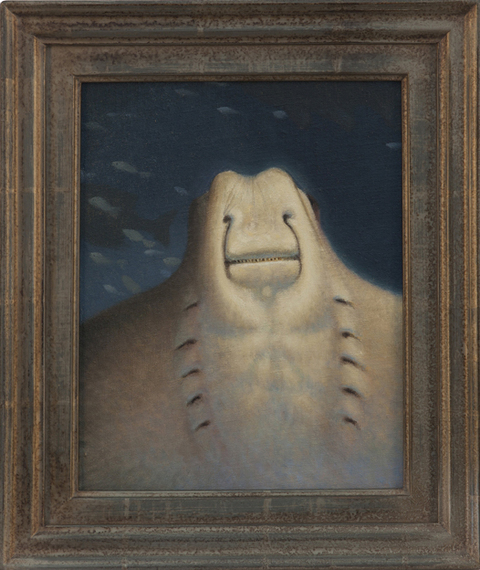 Can you think of another painter working today who is working to make cartilaginous fishes so inviting? 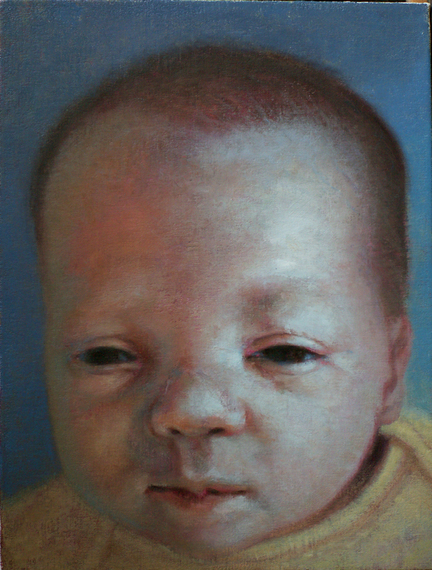 In contrast, Zokosky's babies and dummies are somewhat creepy: which you would expect from paintings of dummies... but babies? Zokosky steps back a bit from everything he paints: His curiosity has always had a scientific aspect. Long known for his paintings of apes -- who sometimes appear as artists at their easels -- Zokosky seems to see things the way that anthropologists used to: All Hominidae are really part of one big family. Of course, what makes Zokosky's art really tick is the fact that he is a great intuitive thinker. 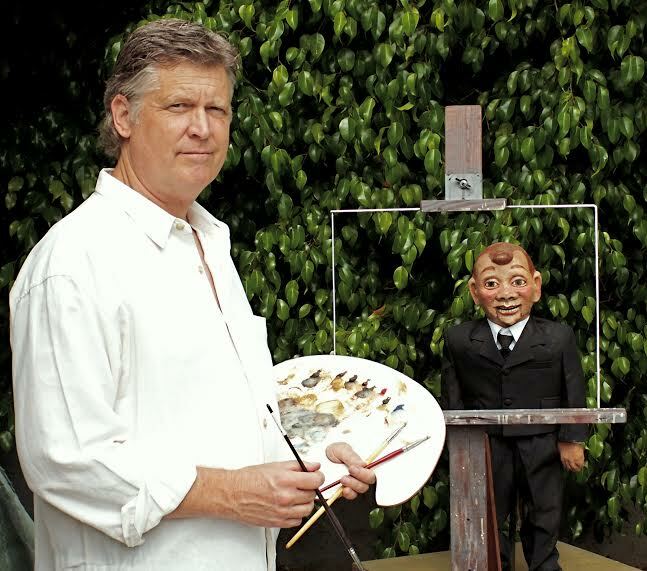 Nothing in his art ever really adds up, and that is what makes his best work so unsettling. There isn't another artist out there who can take his intellectual caprices and play them out so completely or so elegantly. His canvases are tenderly painted, perfectly resolved -- in formal terms -- and glowingly lit. They not only ask questions, they multiply questions. Unsettled works by slowing you down and making you see things the way he does: with seemingly infinite curiosity and patience. Noel, 2014, oil on canvas, 21 x 16"
How did you decide to paint babies? Good question: Babies are about as odd and strange as a human can be but still be considered beautiful. I painted one six feet tall, retaining its proportions and at adult size it was truly frightening. Their heads are enormous, and their arms and legs are tiny. Babies are beautiful because we love them, we don't love them because they are beautiful. It's a good illustration of how we are wired. We adore certain helpless creatures. Naturally, we all start as babies, so there is a universal, undifferentiated quality. Perhaps another appealing aspect is the pure potential they embody. I like the fact that we can care for and nurture these funny looking humans. They are hard to paint, they're so smooth and their faces lack to topography an adult has, they're like Arizona, lots of space between a few points of interest. 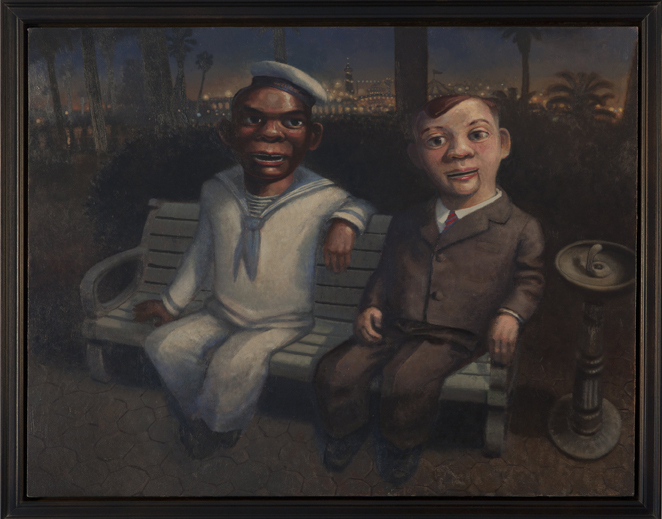 Embarcadero, 2014, oil on panel, 22" x 28"
Is it fair to say that much of your subject matter goes right to the edge of creepy? I suppose that's true much of the time. I don't try to make them creepy, or near-creepy, I try to make them engaging and interesting to look at. I like the uncertainty that comes with experiences that don't conform to expectations. Not quite cute, not quite horrible, that in-between space seems the most interesting, it's where growth can take place. For me life feels that way, and I think art has to function the same as life, or it seems false. You could argue that if life provides that experience then why ask art to do it, I'd respond that art is a distillation of life, it points to something vague and mysterious and makes it a bit more concise, if freezes it so that you can ponder it, maybe it helps you to deal with the unknown a bit. Disturbing things can be beautiful and gratifying when we see them in context. Skeleton Boy, 2014, oil on panel, 24" x 18"
There is a saying: "Every painting is a self-portrait." Does that idea apply at all to your work? The self is all we've got: It's the portal to everything. My sensation of everything is limited to what touches this organism I call "me". Our eyes don't extend into new frontiers; they're not walking catfish, they're sea anemones, they're passive and they only ingest what comes to them. We share the room but each of us occupies our own space. What I mean is that all we can comment on is how we see things. I'm comfortable with the notion that every painting is a self-portrait of some sort in that it refers to our own interpretation of what we experience. 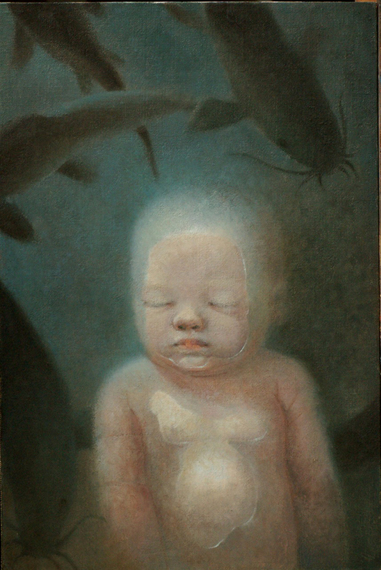 Sugar, 2014, oil on panel, 13.25" x 11.25"
The subjects in the Koplin show -- babies, dummies and "smiling" rays -- all seem to have hints of personality. Are you trying to point out the shared aspects between animals and humans? I'd say they all have shared aspects, to call them "human aspects" makes it sound like we invented it and they picked up on it. It's not so much that they seem like us, as much as we all seem alike. Vertebrates are pretty much variations on a theme. When we relate to them it's because we're similar. It feels like I'm splitting hairs, but I think there's a significant difference being discussed. Psyche, 2014, oil on canvas, 18 x 12"
What kinds of reactions do you hope this show will evoke? I suppose I'd like to hear someone say: "I hadn't thought of that subject as beautiful and important and interesting, but I can see how it is." I'd be disappointed to hear "creepy things are cool, and these are totally cool." I'm trying to point out things that are really meaningful, if you make the effort. They aren't a joke, I'm serious about what I do; which is not to say absurdity is out of bounds. I want the work to hold up, to remain engaging. I'm willing to forego the "wow factor" -- is that term still being used? -- in favor of the "hmmm... factor." I like a slow read, something that continues to unfold over time: I work hard to make these paintings beautiful. Another reaction I like is "That seems meaningful, I want to live with it." That's a great compliment. Listen: Podcast interview of Peter Zokosky by Mike Stice. Followed by a book signing of "Ten Rather Eccentric Essays on Art"